The M4 Medium Tank - the Sherman - was one of the most famous tanks of the Second World War. It was produced in greater numbers than any other Allied tank, it fought on every front - in Western Europe, on the Eastern Front, in North Africa, Burma, the Pacific - and it continued to serve effectively as a front-line fighting vehicle in the Korean War, the Arab-Israeli wars, the Indo-Pakistani wars. … Pat Ware's new history of this remarkable tank covers in detail its design and development, its technical specifications and the many variants that were produced, and he reviews its operational role in conflicts across the world. **While the Sherman outclassed the older German tanks it encountered when it was first put into combat in 1942, it was vulnerable to the later German medium and heavy tanks, the Panther and the Tiger I and Tiger II. Yet, as Pat Ware shows, the Sherman was more effective than these superior German tanks because it was cheaper to build, reliable, easy to maintain and produced in such large numbers. It was also adaptable - it was converted into a tank-destroyer, an amphibious tank, a recovery vehicle, a mine-flail, a personnel carrier - and, after the Second World War, the soundness of its original design was proved as it was developed to confront more modern tanks in combat. 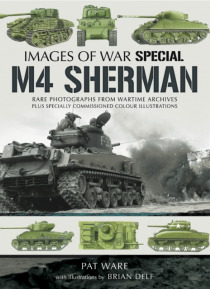 **Pat Ware's expert account of this remarkable fighting vehicle is accompanied by a series of colour plates showing the main variants of the design and the common ancillary equipment and unit markings. His book is an essential work of reference for enthusiasts.